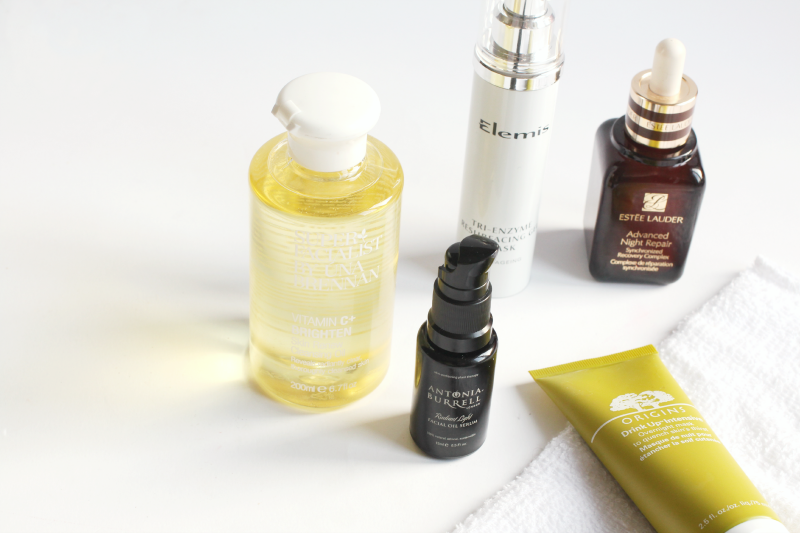 We seem to have a bit of an unintentional colour scheme going on here… Today’s post is all about those AW skincare essentials, the products that pamper and protect, restoring wind-battered skin back to its usual radiance. Autumn, I love your style but I dislike your weather so lets get on with the skin saving products, shall we? Starting with a cleanser, it’s so nice to take your makeup (plus all the dirt and grime that gets blown into your face when it’s windy!) off with a nice oil based cleanser. For this I love the budget Una Brennan Vitamin C+ Cleansing Oil, as it works well to remove stubborn eye makeup and foundation, while leaving your skin hydrated instead of stripped like some makeup removers can. Plus it smells amazing, so you can’t go wrong really. Masks always play a huge part in my AW skincare routine, as they’re the best, and quickest, way to get skin looking normal again. If my skin is looking dull and a little lacklustre, I’ll reach for the Elemis Tri-Enzyme Resurfacing Mask, which buffs away dead skin cells in 10 minutes to reveal a brighter more radiant complexion. If skin is dehydrated which, lets face it, it’s gonna be as the temperature drops, then a layer of the Origins Drink Up Intensive Overnight Mask works wonders. It really puts the moisture back into your skin, leaving it more plump and keeps dry patches at bay. I always up the hydrating and restoring serums in Autumn, as they do work so well at protecting your skin. My everyday serum for morning and night has been the classic Estee Lauder Advanced Night Repair (original formula) recently, as my skin has been loving it. It’s light, sinks in fast, yet just gives skin an amazing boost and makes it look so much smoother and even. Plus a little goes a long way, so a bottle lasts ages! Finally, as facials are oh so high on my list of loves, a new one I’ve fallen head over heels for is the Antonia Burrell Radiant Light Facial Oil Serum. I already love her Pure Therapy version, as it really does sort out blemishes overnight, but this one gives so much more of a glow to the skin. It really does brighten everything, increasing moisture levels and evens out skintone. Her beauty line is well worth checking out if you want to convert to more natural, yet extremely effective, products!